Vintage late 70's, early 80's Vogue Paris Original pattern for Misses' Dress and Jacket designed by Emanuel Ungaro. 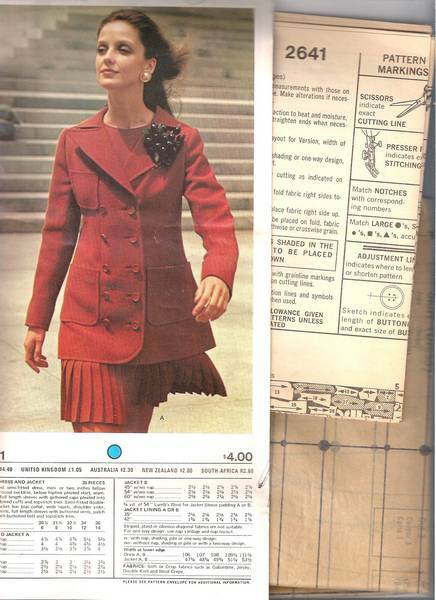 The pattern sheets and instructions are wrapped in a portion of a counter catalog page, as shown, which contains all the yardage info. All other necessary info is in the instruction pages. High waisted, semi fitted dress in mini or below knee length has below hipline pleated skirt, seaming detail, full length sleeves pleated into shaped buttoned cuffs. Top stitch trim. Double breasted jacket has bias collar, wide lapels, shoulder yoke, side back vents, long sleeves with buttoned vents, patch pockets and back buttoned belt. Top stitch trim.